Almost all the enclosure walls of the city of Bergues were preserved. Fortunately, numerous remains of the fortifications and structures testified of its various periods of construction. The north curtain wall and the tower Guy de Dampierre (1286) both dates from the Counts of Flanders period. The Nekerstor, the Porte de Bierne, and the curtain wall which goes along the street Pierre DECROO (1418) are the legacy of the Dukes of Burgundy. A new type of bastioned fortification appears during the Spanish period, a buried type. It’s the western front between the Porte de Cassel and the Porte de Bierne (1585). Finally, Sébastien LE PRESTRE DE VAUBAN, will complete the whole. Particularly, the Crown of Saint-Winoc (1672-1692), task which will be then continued by his successors: the crown of Bierne, in 1720 and the crown of Hondschoote, in 1741. To access Bergues, you have to go through a fortified gate or, in the worst case, through a breach in the fortification walls, whatever the path you will take, you will not be disappointed ! The “Porte de Bierne” : The plan is similar to a small castle flanked by two powerful towers in the front, framing the drawbridge. The “Porte de Cassel” : Of classic style, this one contrasts with the Porte de Bierne and de Dunkerque. The top of its pediment is decorated with a sun, a symbol of Louis XIV. The “Porte d’Hondschoote” : A gap in the wall is the only remains of this gate that looked like the Porte de Cassel. As all other gates, it was equipped with a drawbridge. The tower of Couleuvriniers : situated near the door of Cassel, owes its name to the introduction of a culverin in the structure, a piece of artillery canon thin and long as a grass snake. The Nekestor : lt’s a water entrance and a flanking tower at the same time, it is the most important tower of the city’s medieval fortifications. The tower Guy de Dampierre (the oldest one of the ramparts towers of Bergues) : it consists of two rooms with sculpted bracket, built of red bricks which distinguish it from the other towers. 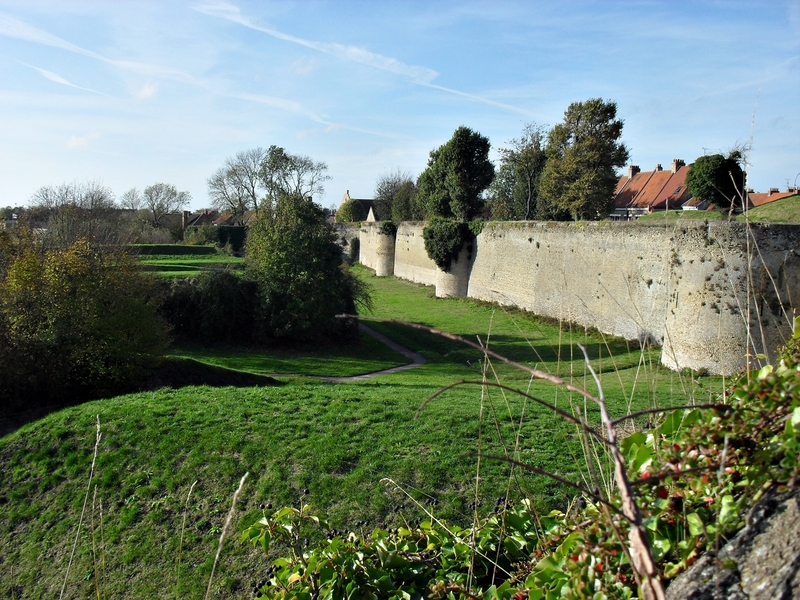 You can visit the Ramparts of Bergues, by your own with a map available at Bergues Tourism reception desk or in joining one of our guided tours.